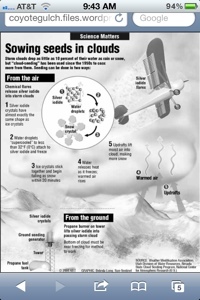 Still not convinced cloud seeding exists? Yawn, wake up. Company is Seeking to Renew is Cloud Seeding Permit! The Colorado Water Conservation Board is holding a meeting later today. “Western Weather Consultants wants to renew its permit for the next five winters so it can do cloud seeding for Denver Water, Colorado Springs Utilities and others. The goal is to boost precipitation and snowpack to benefit water users, from farmers to ski areas. The cloud seeding program is seemingly designed with the use of public money over private land without voter approval or landowners permission. Do you own the clouds over your head? 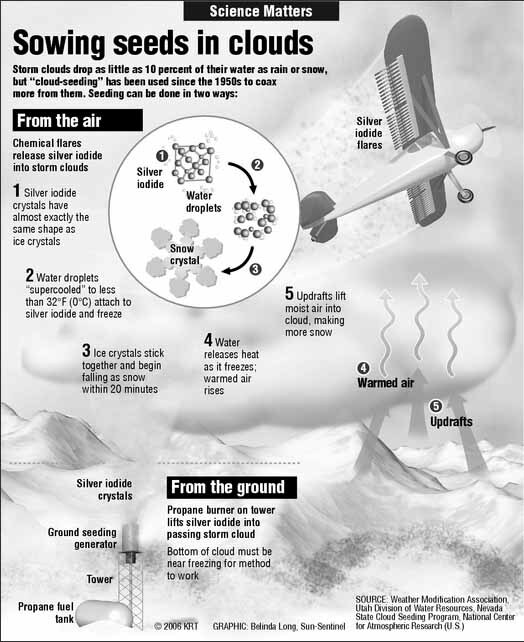 And the implications of years of accumulation of silver iodide in the water? The air? Dirt? Who know if anyone bothers to test. Looks like its only harmful if you inject it, breath it or get it on your skin. Whew! There’s about a snowballs chance in hell we would eat a snowball in Colorado.